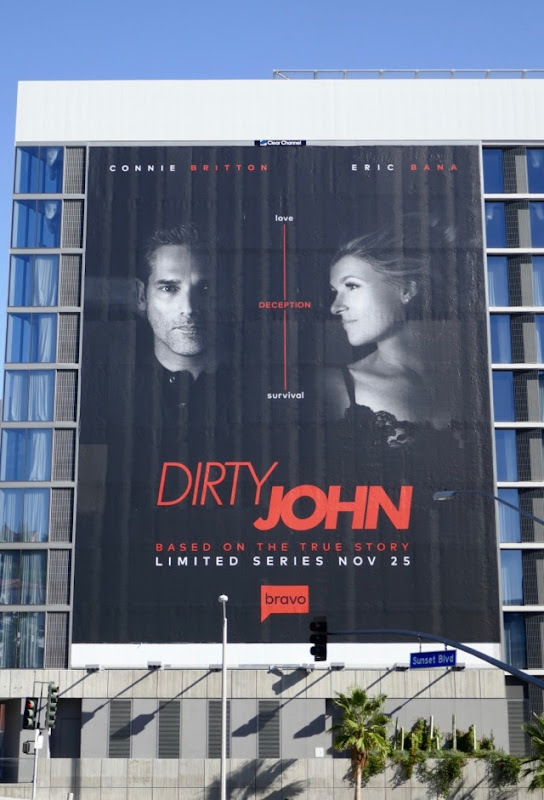 Bravo's new limited series, Dirty John, is the latest podcast-turned-TV show and stars Eric Bana and Connie Britton. Based on the true crime podcast by journalist Christopher Goffard, Bana stars as the charismatic 'John Meehan' who sweeps up Britton's 'Debra Newell' in a whirlwind romance, but her daughters (played by Juno Temple and Julia Garner) begin to suspect he has sinister intentions. These giant-sized and standard landscape series launch billboards were photographed along Sunset Boulevard on November 23, 2018. Fans of Connie Britton can also check out these 9-1-1 billboards and these Nashville billboards, whilst Eric Bana admirers can check out these Special Correspondents film billboards. With shows like Homecoming, Lore, Alex, Inc, 2 Dope Queens, Pod Save America and now Dirty John, podcasts have becomes Hollywood's new idea fodder, let's see if the trend continues in the coming months. 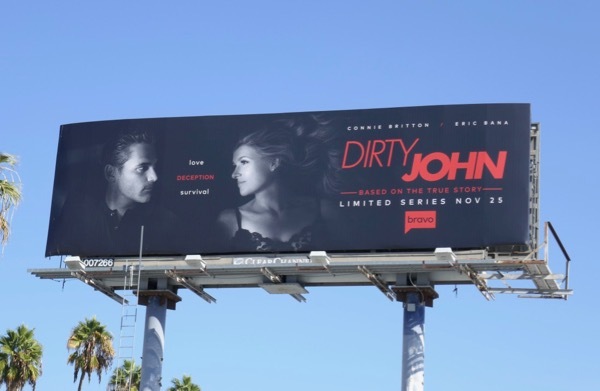 UPDATED: Here's another landscape billboard for Dirty John, which is apparently the most watched scripted drama on Bravo to date, snapped along Lankershim Boulevard on December 1, 2018.